In my defense, it’s not like sea glass is just sitting in the sand waiting to be picked up. It rests in the rocks because it is so light it won’t stay on the beach unless it gets caught on something. On a very rare occasion if a piece of glass is at the very top of the wave it might be left in the sand. But usually, the next wave takes it back to the sea. For those of you wondering what sea glass is, Wikipedia defines it as “naturally produced sea glass (“genuine sea glass“) originates as pieces of glass from broken bottles, broken tableware, or even shipwrecks, which are rolled and tumbled in the ocean for years until all of their edges are rounded off, and the slickness of the glass has been worn to a frosted appearance”. 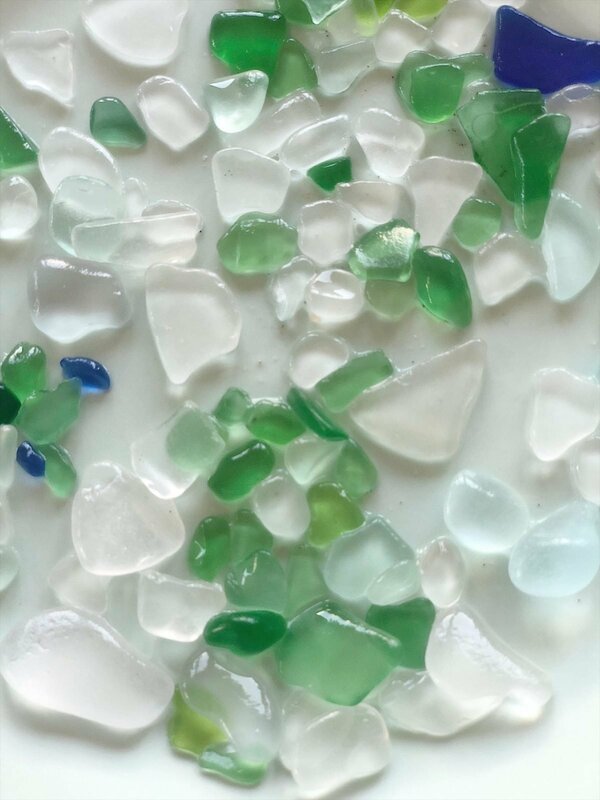 You can buy manufactured sea glass at some craft stores, but this type is just glass tumbled in a large tumbler. It’s not the real thing. So where does sea glass come from? 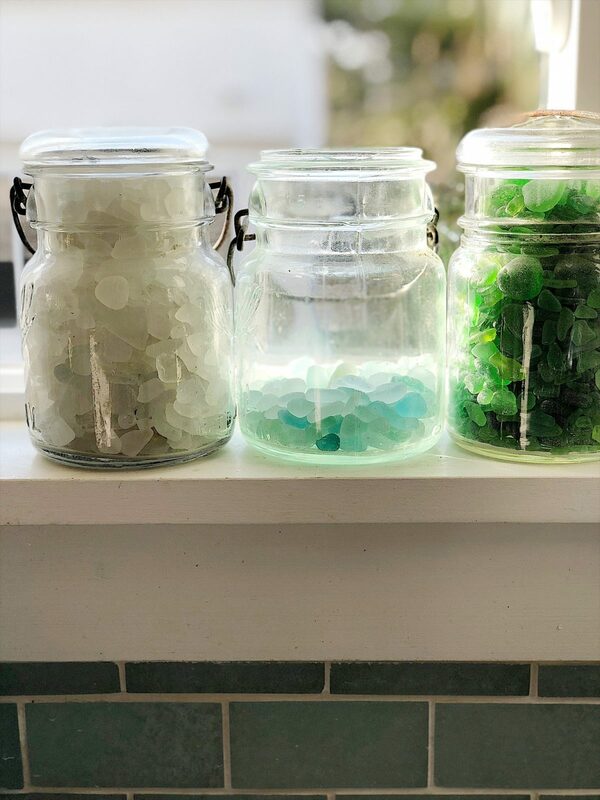 The common colors of sea glass are green, brown and white and are still in wide use today. 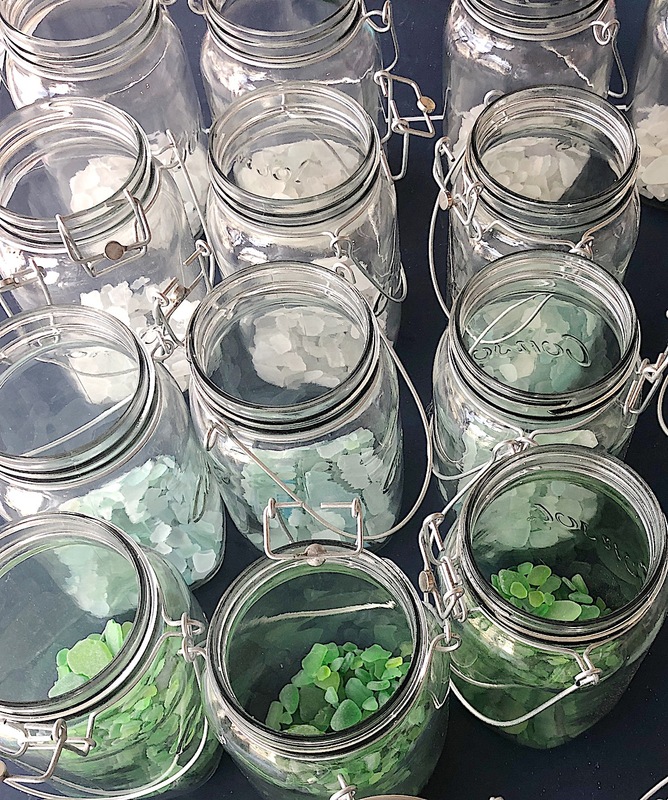 Rarer colors of sea glass, such as aqua, cobalt blue, red and yellow are pieces that in many cases the color has not been made or used for many years. Green glass comes from beer bottles, wine bottles, and soda bottles. White or clear glass comes from a ton of sources such as bottles, glasses, and windows. Brown glass comes from beer and whiskey bottles and other popular household products. Aqua or seafoam green (which happens to be my favorite color) comes from coca cola bottles, some liquor bottles, and window glass. Cobalt blue comes from Milk of Magnesia bottles, many household bottles, and very old poison bottles. Very rare red glass comes from Anchor Hocking glass, ship lights, car lights, and old bottles. About three years ago I was walking on the beach and I noticed some women on the beach who were hunting for something in the rocks. When I asked them what they were collecting I about died! I could not believe these was sea glass on the beaches right in front of our house. I have been a collector ever since. Below are two photos of glass I collected on one walk on the beach. My walks lasted a few hours and I spent a lot more time collecting than I did walking. This was my “best haul ever”. 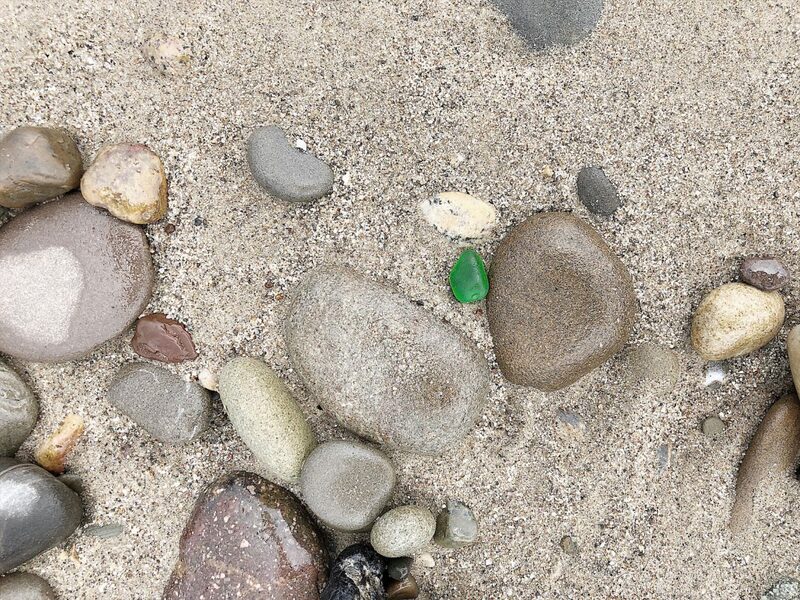 My tips for collecting sea glass are to look for small rocks, about the size of a quarter. Try to go at low tide. 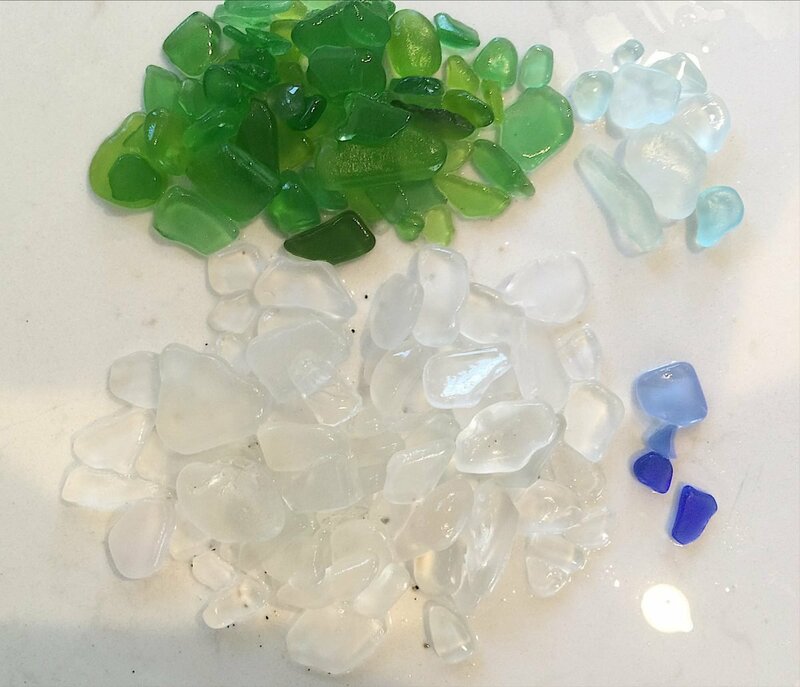 If you can hunt after a storm or large waves you will find more sea glass. Wear shoes so you can spread the rocks with your feet. And most importantly, have fun. Everybody also asks me what I do with the sea glass after I collect it. For now, I sort it by color and put it in these awesome vintage jars. I need to start looking for more jars because they are almost all full! 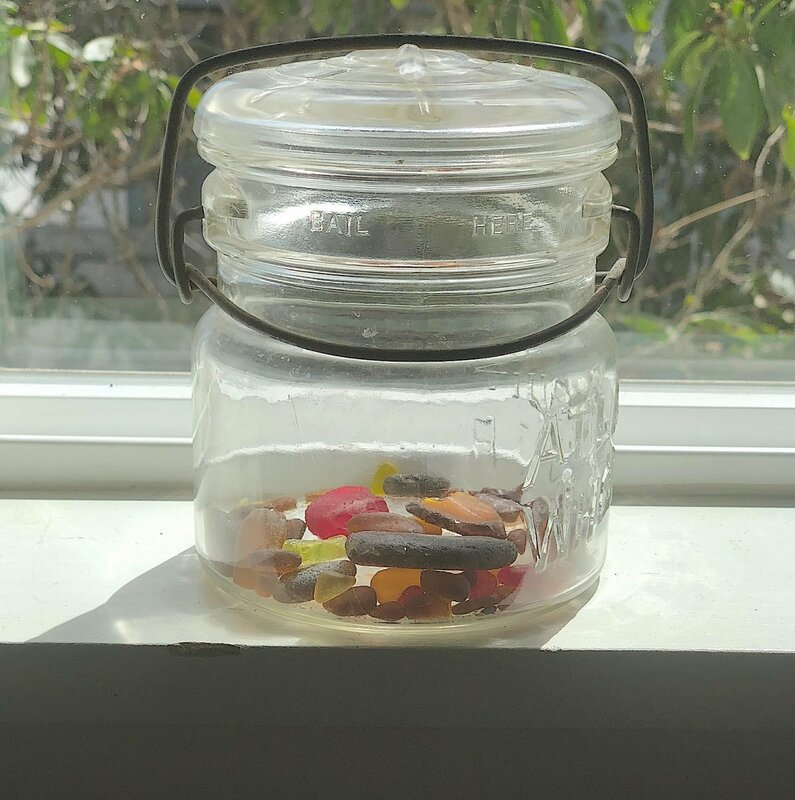 This is what I call my “reject jar” which makes no sense since the red and yellow are by far the rarest of the sea glass I own. But they don’t match the color scheme of our home so I keep them well hidden. Haha. 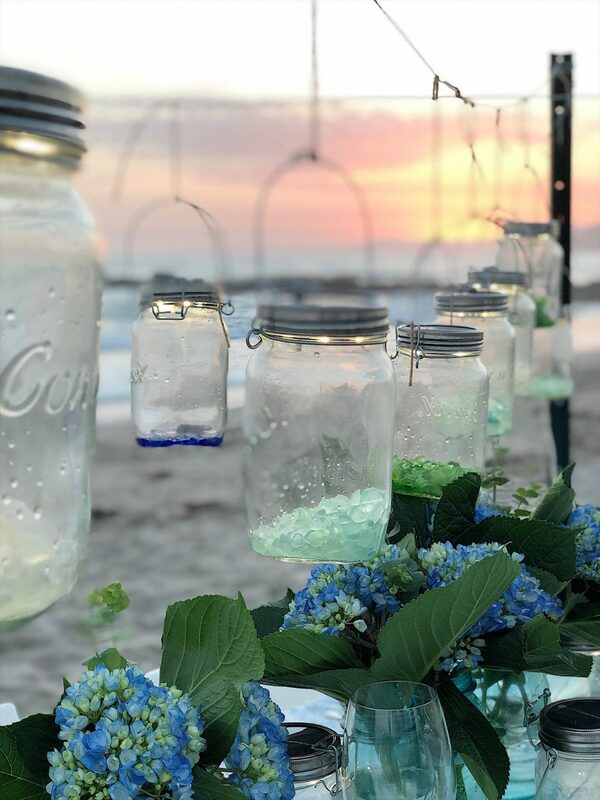 Recently I did use my sea glass in these ball jar solar powered lanterns by Sonnenglass. I filled each one with about an inch of sea glass. And then I hung them above a table I set on the beach. 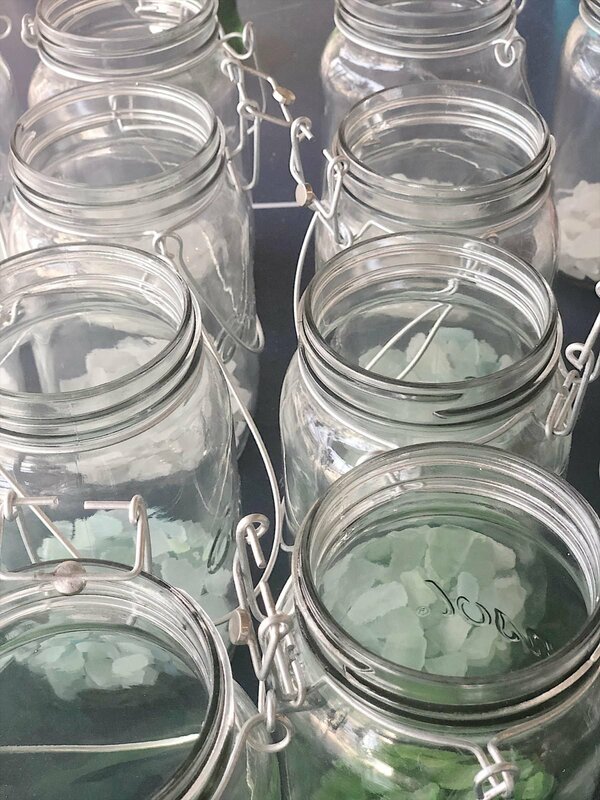 I love how magical the sea glass looked and the fact some of the sea glass I had collected that day was in the jars! 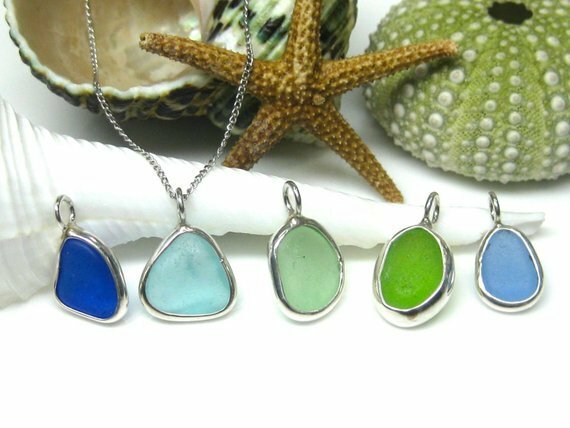 Someday I would like to try to make some sea glass jewelry. I love this sterling silver bezel wrapped jewelry you can find on Etsy. Does anybody know how to make this? Is it hard to do? Because I am dying to learn! Lastly, I do want to tell you all that I have seen photos of Sea Glass beach located in Fort Bragg, Ca. It’s a beach that is literally covered with sea glass everywhere. I have hundreds of photos that have been sent to me about this special sea glass beach. 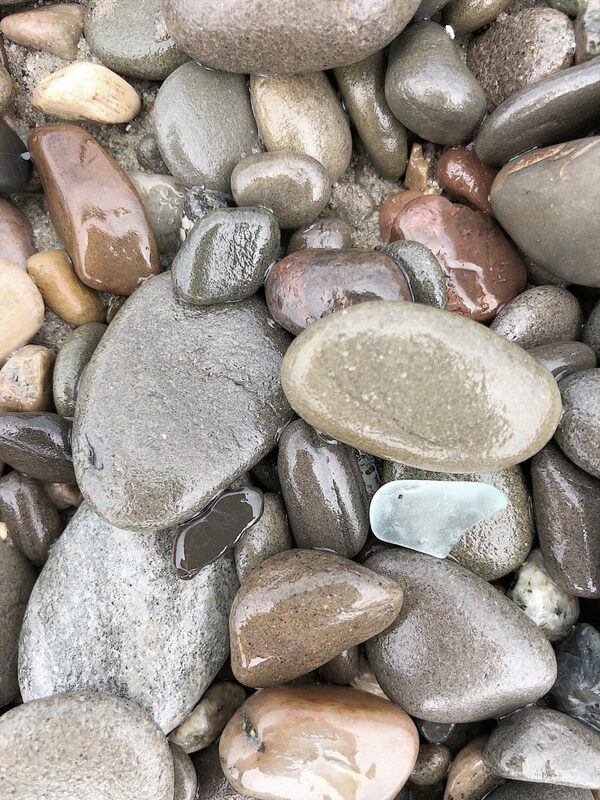 Unfortunately, a lot of people don’t know that if you visit there you are not supposed to remove any glass from the beach. It’s a very popular tourist spot and I am fearful that soon all of the glass will be gone! 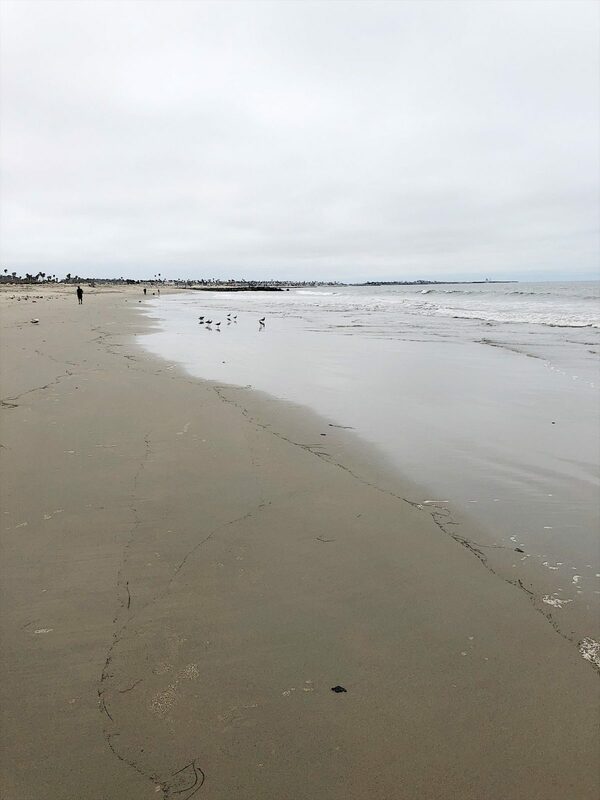 In the meantime, you can find me hunting for sea glass on Pierpont Beach in Ventura. And loving every minute of it. I grew up going to the beach . My grandma lived there. Every other weekend. I was young and I too fell in love with the beautiful sea rocks. I still have my collection . When my husband and I go to the beach I’m always on the hunt for new beautiful pieces. Fun! How timely! Yesterday, my sister and I, went to Matagorda Beach (about 60 miles south of Galveston, Texas). She knows I collect sea glass so as we strolled along the beach, she helped me find about 6 pieces. She found the brown ones, and I was elated to find green pieces. My collection is small, but growing! I love your display idea! I know you wrote this just for me! 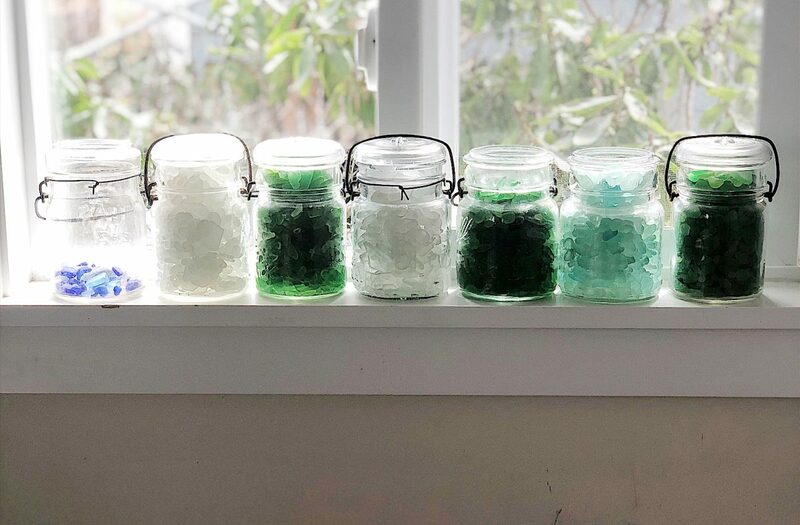 I just have 1 tiny jar of mixed colors but collecting sea glass has moved up to a high priority for me and I’m going to use all your tips for sure! Didn’t think about wearing shoes! Maybe I’ll come down your way and join you some time ???? Thanks Leslie! The Santa Barbara Sea Glass Festival is coming soon! Maybe you can find the jewelry you are looking for? Just popped up on my FB. Living in the mid-west I can only find sea glass when vacationing. I started collecting it about five years ago and only have a half Mason jar filled. I have sea glass mainly from the Caribbean and a few pieces from Florida. Your pieces are beautiful! You should look for the children’s book The Story of the Sea Glass by Anne Wescott Dodd. You will love it! I love your collection of sea glass and putting them in the solar lights was brilliant!!! That table on the beach looks dreamy. I’m going to start looking for sea glass on my next trip to Aptos. 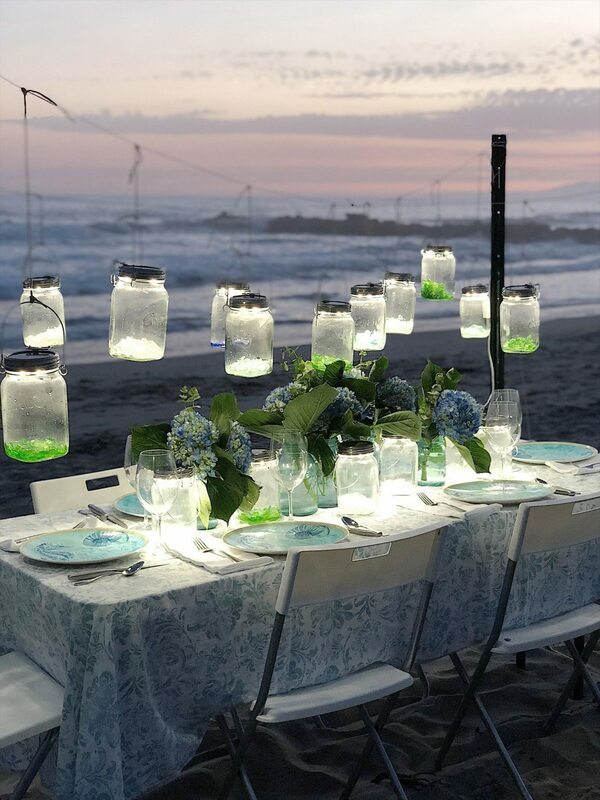 Love the idea with string lights with the mason jars. We just returned from a week on the coast of Maine and my 6 year old was obsessed with all the sea glass she collected. I’m trying to figure out what we can do with it – thanks for the idea! I am so happy that I am not the only one that loves the beauty in sea glass. Love how you display your collection!